We got another Bbq sale banger for you all to enjoy. 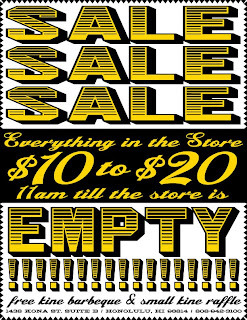 Please feel free to come down this Saturday for another blow out sale. Everything on the floor $10.00-$20.00. 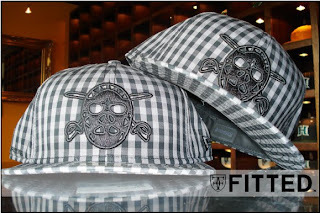 Plus we got 2, one off samples that will be raffled off. 11am until the store is empty!!! Aloha folks. Today we unveil a new design titled Economics, in due part to the photographs featured on this shirt. Printed on all white, it features photos of our ever growing urban landscape/cityscape and the airport which all play a huge role in making Hawaii’s economy turn. 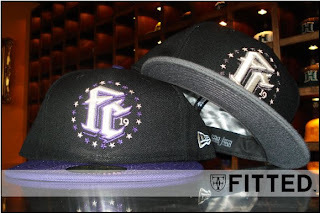 The back features our FITTED crown hit in teal, purple and black. Along with this new shirt we have an all blue UH hat (duck cotton tonal) including a custom Kansas City Royals in all brown with blue eyelets, scarlet button and the logo features hints of blue and white. Setting things off with the shirt printed on all white, this tee features 2 “Fs” on the front in kelly green which pays homage to the unique UH logo, but freaked with our trademark FITTED twist. The bottom left of the front features the FITTED crest, crown and ASD (Aloha Served Daily). On the back is “FITTED” across the top with the number 1 also in kelly green. 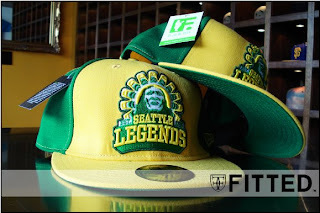 With the hat, we wanted to give it a football helmet feel to it, and damn we do a good job! 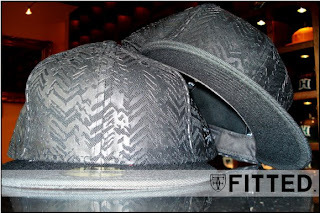 Ran in all black, there’s a “triangle tribal” pattern running down the middle, the right side features new crest printed all over which wraps around to the back right side. 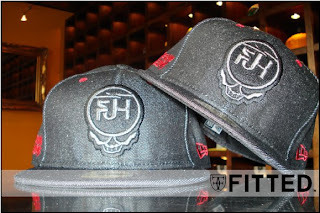 On the left is the same “double F” as seen on the shirt in raised embroidery, with the New Era logo resting right beneath. 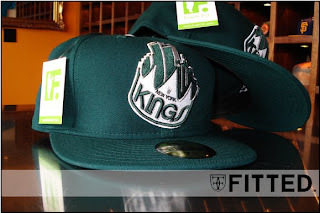 The back sees the FITTED crown and crest in tonal black stitching while the inside features the satin triangle pattern in kelly green lining. This is definitely one that you need to break the piggy bank for, so please act accordingly and head down early on the day of release, which is Sept. 27 @ 11 AM. First come, first serve…. 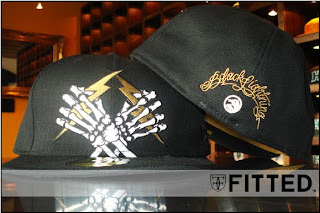 Flying Coffin, Slick, Frank, Beandip, & Amongst Friends in the Store Now. 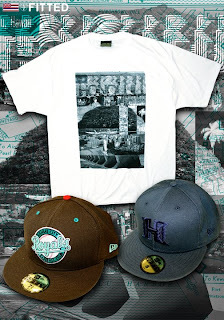 Tuesday 9/23 we’re releasing a new t-shirt along with 2 new custom MLB caps. The shirt is dubbed “The Kush” which pays homage to one of the greatest contemporary Hawaiian bands, The Krush but with a little flip on play of words. When it comes to that herbal meditation, the Kush strain (Master Kush, Hindu Kush, Purple Kush) is probably the greatest herb to grace the face of Earth. 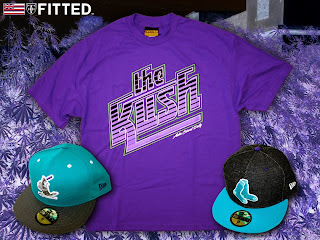 The shirt is printed on all purple with “The Kush” written in that familiar font you may or may not recognize. 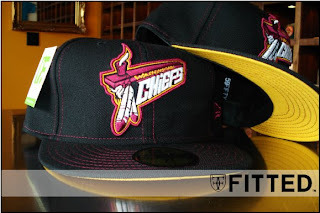 The back shows the FITTED crown hit. 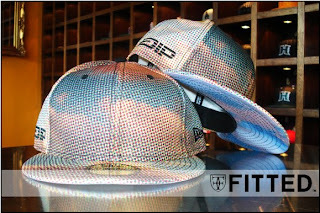 The first custom is a St. Louis Cardinals in teal with a gray brim and hints of white & purple, white eyelets topped off with a teal button. 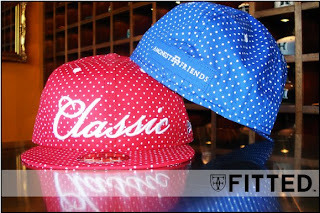 The second is a Boston Red Sox in black with a blue brim, blue eyelets & blue button and a blue Boston logo – time to set it off! 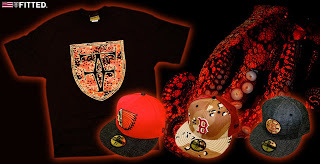 Once again, this Saturday (Sept. 20) we continue with our twice a week release, this time with a pack called “Red Dawn.” Printed on all black, it features our crest in front with a pattern resembling the abstract pattern on an octopus, almost like an abstract reddish-camouflage pattern. 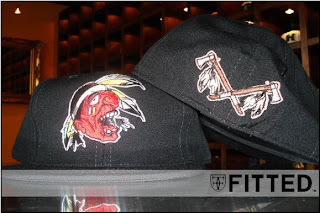 3 hats come along with this, all hailing from Beantown, Massachusetts (a/k/a Boston): Boston Braves (Cooperstown) which features all red with a black denim bill and a logo featuring the head of an Indian, Boston Red Sox with camo on the front 2 panels, red on all back four panels and a red Boston logo, and finally an all black denim Boston Bruins with tan and gold colors used on the logo. Get in there early! 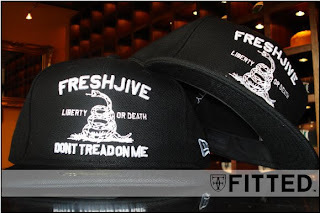 A few hats in the store. Check them out..
New t-shirt graphic features a gecko or better known here as a mo’o (which is commonly seen throughout the islands, a true friend, especially if you despise cockroaches as much as I do). 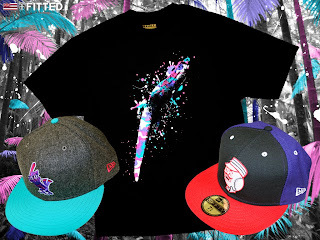 Printed on all black, the graphic also features a splatter of bright colors that form a camoflauge on the front, and those same colors used in the FITTED crown on the back. Add to that an ill custom Baltimore Orioles in gray flannel wool with a teal brim and pink eyelets with a teal button. On top of that is a Cincinnati Reds custom using a different logo, the back four panels are purple and the front 2 panels are black. Perfect colors to blend with the shirt. Just a quick heads up. We released 3 different colorways in the Kamehamehas: orange with black (SF Giants colors), gray with neon green (perfect for your Air Max’s or Air Jordan Fusions), and lastly red with gold and black denim bill. Hurry up and get yours, they’re going quick!! POLOLEI ( straight, direct, accurate; eyes front). 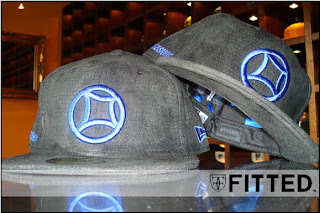 This time we are once again rocking the “H / Pride” hats. 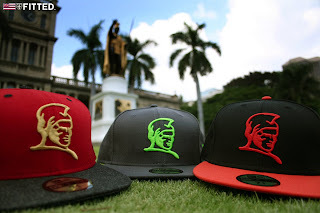 Remember the first huge drop which consisted of the red and gold Kamehameha hats and green and orange Pride caps? Well, we went back & revisited the Pride “H.” There has been a huge demand to bring these back, and so we answered. 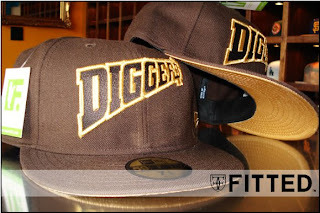 There are two colorways in these: brown and blue. Getting into the details: the brown version features 100% cotton in brown / tan with horizontal striping wrapping around the cap. 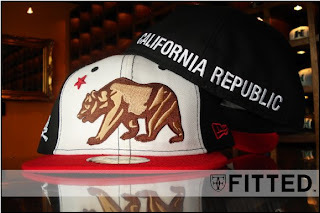 On the front in raised embroidery is the “Pride H” logo in orange with a white stroke, the left side features a New Era hit stitched in white, the back sees the FITTED crest in white with an orange fill, and the right has a FITTED crown hit. 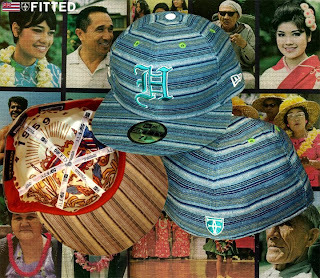 The inside of the cap features a satin lining of one of the first Hawaii State seals with an orange sweatband. 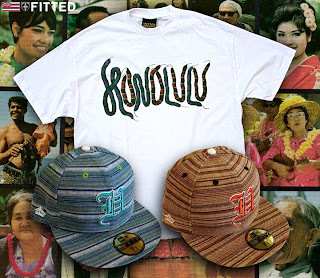 The second version is in a blue colorway with the same horizontal stripe design wrapping around, and a teal raised embroidered “H” logo in Old English lettering, sating lining with the same Hawaii State seal and a teal sweatband. 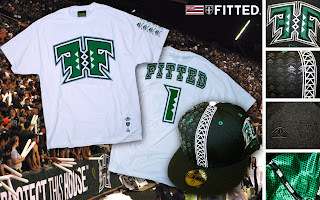 Since Hawaii has no professional State sports team, we have designated both the Pride and Kamehameha hats as just that, hence the name “Pride.” On to the shirt, printed on all white – the graphic features feather leis in many colors (which represent our diverse culture) which spells out the word “Honolulu” on the front, the back has a FITTED crown hit in black with a green stroke. This is a first come first serve drop, But we should have enough to go around. Phone orders will be taken after 12 noon as usual. We appreciate all the love and support, see you Saturday..